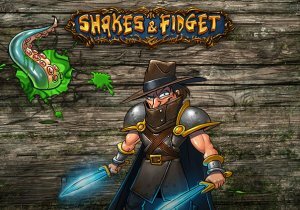 A huge update is coming today at 5 pm CEST for Shakes & Fidget! “The Underworld” is coming, and with as sunny and bright as the world of Shakes & fidget is, the underworld is equally as dark and gloomy. Anyone digging too deep in the gemstone mine will not find the heart of the mountain but will encounter The Heart of Darkness instead. And with this jewel, the terrible underworld opens its gates today! There’s another challenge waiting deep beneath this fortress. Players who have upgraded their gemstone mine to 10 can encounter this “Heart of Darkness”, a jewel that opens the gate to the Underworld! Once the players have taken possession of the heart, they are able to explore the fortress’ mysterious catacombs and start building their own “Dungeon Keeper”-style underground empire. The new resource is just as bleak as the scenario: the souls of fallen heroes. Not just any hero, but real players. Shrewd gamers, therefore, lure other players into their dark realm – where they receive a warm welcome by an army of goblins and trolls with sharpened axes. The collected souls can then be used to visit, erect, and expand ten different characters, machines, and places. Each new level provides important resources and skills to help players improve their characters. For example, the new Time Machine transforms unused Thirst of Adventure into experience points. Regular training with the Gladiator increases critical damage and the underground Gold Mine helps players to fill their treasure chambers.